Southwest Silver Gallery is pleased to offer gorgeous liquid silver jewelry in the form of necklaces, bracelets, and earrings that are hand strung by talented Navajo and Southwest artists from Arizona and New Mexico. Liquid silver gives off a luminous shimmer that is often compared to a waterfall due to its dazzling visual effects, and this type of jewelry has long been an incredibly popular and sought-after accessory. Our Native American liquid silver jewelry is made of genuine .925 sterling silver, a substance that Native American artists have been skillfully working with for over a century. 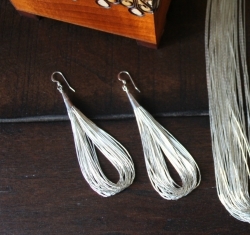 To produce liquid silver jewelry, special extra fine, tubular silver beads called "heishi" are hand strung on strands to create those shimmering belts of silver. Liquid silver beads can easily be combined with gemstones to add additional stylistic flourishes, and we select for only authentic, high-grade gemstones such as the pure Southwest turquoise we use in our turquoise liquid silver jewelry. Sterling silver came into use in Europe during the 12th century, mainly as currency. The substance was invented to make fine silver a bit stronger so that it could be molded into useful objects, as pure silver is delicate on its own. This discovery led to silver utensils and jewelry, a craft that circulated throughout Europe and eventually America, where Native American tribes began to work with it in their own jewelry-making art forms. 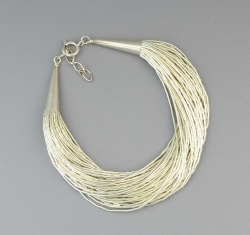 The sterling silver used in our liquid silver jewelry is genuine and provides a dazzling shine. Turquoise on the other hand has been beloved by cultures as diverse as the ancient Egyptians, Persians, Aztecs, and Chinese -- as well as numerous Native American tribes -- for its vibrant blue and blue-green hues. Turquoise is believed by many cultures to be a holy stone and a symbol of wealth and good fortune. Besides the turquoise in our liquid silver pieces, we offer other authentic gemstones such as amethyst, lapis, malachite, onyx, pink pearl, and more. 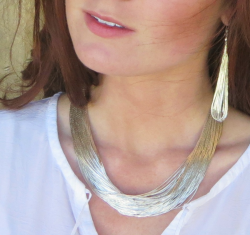 Our liquid silver jewelry looks great with whatever outfit you happen to pair it with. Our necklaces can be worn by themselves loosely, or they can be twisted or combined with pendants, depending on your preferences. Our liquid silver bracelets and earrings look great when worn with anything as well. When you take them off, it is recommended that you keep your liquid silver pieces in airtight containers or zip lock bags to preserve their shine. They can also be cleaned with Hagerty's silversmith spray and a polishing cloth to keep them in pristine condition. Southwest Silver Gallery has worked closely with local Navajo, Southwest artists and Santo Domingo tribes to bring the finest liquid silver jewelry on the market. Each of our distinct pieces comes with a certificate of authenticity and guaranteed satisfaction. If you have any questions about our inventory, call us at 888-476-4367 and we'll be happy to help. Browse our gallery and order your liquid silver pieces today!